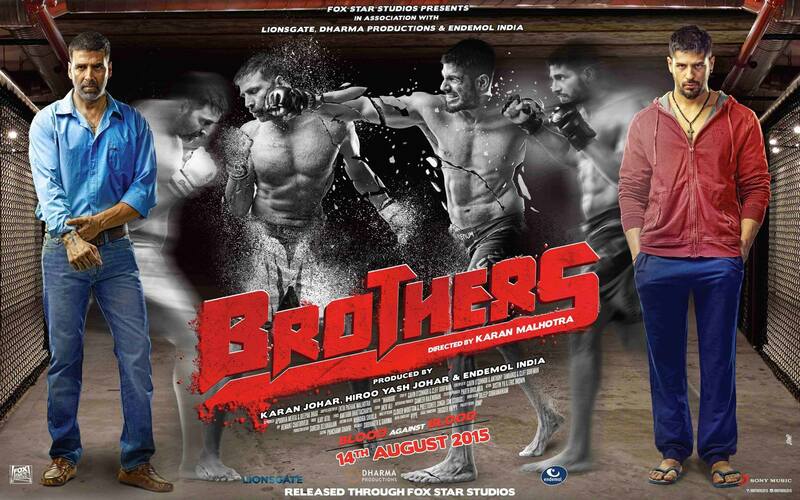 Akshay Kumar and Sidharth Malhotra are believable as brothers and as fighters. I only wish the rest of Brothers was as convincing, or even simply capable of putting those two things together. Instead, Brothers is a series of solid fight scenes that’ll make you cringe in sympathy at their realism, thoroughly ruined by an amateurish attempt at drumming up family drama and tons of needless exposition. Filmmakers take the 2011 Hollywood mixed martial arts movie Warrior and instead of building upon it, they totally muddle it. David (Kumar) and Monty (Malhotra) are the sons of former fighter turned drunk turned felon Gary Fernandes (Jackie Shroff, rather overacting), and they were divided by the crime that sent dad to jail — the one you won’t learn about until halfway through the movie even though the opening scene is Gary’s release from prison. David was a fighter who gave it up to become a teacher after marrying Jenny (Jacqueline Fernandez, de-glammed and capable in her handful of scenes), but his daughter’s medical bills have forced him back into the lucrative ring. What Monty has been doing in the last many years that dad was in jail is less certain, aside from fighting, of course. After dad comes back and tells him to direct his anger into fighting (a duh line if ever there were one), Monty suddenly becomes a wiz at this and a video of him beating up a larger man goes viral. If that seems extraneous and overwrought, well, like most of this movie, it is. Scenes drag on and on and on past the point of being bearable, never more apparent in a character that lays dying for several minutes while the other characters fumble around but never actually attempt to help in any way. The movie takes eons to even start as Shroff as Gary fumbles around in jail, out of jail and then especially in EVERY SINGLE ROOM of his home, and the intro to the climactic fighting championships is the most endless and ridiculous thing ever; the fireworks and commentators carry on for probably twice as long as all of the fight sequences together. The problem is none of the people who do most of the talking (mostly fight promoters and commentators), have much important to say. Instead they just spout absurdities like the big bad German fighter being “straight from Hitler’s own country!” and endlessly repeating how the championships — ridiculously called “Right to Fight” (as in: “You all have a right to fight!”) and even more ridiculously shortened to R2F — will legitimize all of India’s fighters currently duking it out illegally on the streets, as if that and an organized sport are totally the same. Perhaps even more extraneous is Kareena Kapoor’s item number ‘Mera Naam Mary’ (if someone was trying to recreate “My name is Sheila,” they terribly failed). The entire sequence is 110 percent dreadful, painfully gratuitous — before any dancing ever begins, men literally douse her in water, put her up to a fan and surround her leering, not to mention the fact that she’s later shown from behind stripping before reappearing in outfit identical except for the color — while devoid of creativity, good costuming and even much choreography beyond the left hip. It’s really bad when an item number is so monotonous that its best move is flipping hair from one shoulder to the other. If only the filmmakers had shown anything else as much thought as they did staging the final, climactic fight the brothers have in the ring instead of beating moviegoers over the head with everything else they could find. 15 queries in 0.330 seconds.